If you are unable to accept the new light of God, and cannot understand all that God does today, and do not seek it, or else doubt it, pass judgment on it, or scrutinize and analyze it, then you have no mind to obey God. If, when the light of the here and now appears, you still treasure the light of yesterday and oppose God’s new work, then you are nothing more than a joke, you are one of those who deliberately oppose God. Key to obeying God is appreciating the new light, and being able to accept it and put it into practice. Only this is true obedience. Those who do not have the will to thirst for God are incapable of being of a mind to obey God, and can only oppose God as a result of their satisfaction with the status quo. That man cannot obey God is because he is possessed by what came before. The things that came before have given people all manner of conceptions and illusions about God that have become the image of God in their minds. Thus, what they believe in are their own conceptions, and the standards of their own imagination. If you measure the God who does actual work today against the God of your own imagination, then your faith comes from Satan, and is according to your own preferences—and God does not want faith such as this. Regardless of how lofty their credentials, and regardless of their dedication—even if they have devoted a lifetime of efforts to His work, and have martyred themselves—God does not approve of any with faith such as this. He merely shows them a little grace, and allows them to enjoy it for a time. People such as this are incapable of putting the truth into practice, the Holy Spirit does not work within them, and God will eliminate each of them in turn. Regardless of whether they are old or young, those who do not obey God in their faith and have the wrong motivations, are those who oppose and interrupt the work of God, and such people will unquestionably be eliminated by God. Those who are without the slightest obedience to God, who merely acknowledge God’s name, and have some sense of God’s dearness and loveliness yet do not keep pace with the steps of the Holy Spirit, and do not obey the present work and words of the Holy Spirit—such people live amid God’s grace, and will not be gained and made perfect by God. God makes people perfect through their obedience, through their eating, drinking, and enjoying of God’s words, and through the suffering and refinement in their lives. Only through faith such as this can people’s dispositions change, only then can they possess the true knowledge of God. Not being satisfied with living amid God’s graces, actively thirsting for the truth, and searching for the truth, and pursuing being gained by God—this is what it means to consciously obey God; this is precisely the kind of faith that God wants. People who do nothing more than enjoy God’s graces cannot be made perfect, or changed, and their obedience, piety, and love and patience are all superficial. 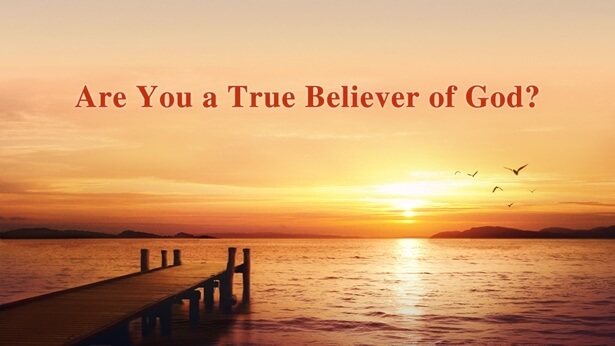 Those who only enjoy God’s graces cannot truly know God, and even when they do know God, their knowledge is superficial, and they say things like God loves man, or God is compassionate toward man. This does not represent the life of man, and does not show that people truly know God. If, when God’s words refine them, or when His trials come upon them, people are unable to obey God—if, instead, they become doubtful, and fall down—then they are not in the least bit obedient. Within them, there are many rules and restrictions about faith in God, old experiences that are the result of many years of faith, or various doctrines based upon the Bible. Could people such as this obey God? These people are full of human things—how could they obey God? They all obey according to their personal preferences—could God wish for obedience such as this? This isn’t obeying God, but abiding by doctrine, it is satisfying and consoling yourself. If you say that this is obedience to God, do you not blaspheme against Him? You are an Egyptian Pharaoh, you commit evil, and you expressly engage in the work of opposing God—could God want service such as this? You’d best hurry up and repent and have some self-awareness. If not, you’d be better off going home: that would do more good for you than your service to God, you wouldn’t interrupt and disturb, you’d know your place, and live well—and wouldn’t that be better? That way you’d avoid opposing God and being punished!